Odisha's Naveen Patnaik-led government has no objection to the allocation of the Khandadhar iron ore mines to South Korea's steel producer Posco, a senior official of the state government said. The Khandadhar iron ore mines in Sundargarh to Posco-India in 2009 for its proposed 8-million-tonne steel plant in Jagatsinghpur district of the state. But, the state's High Court later annulled the allocation, forcing the Odisha government to approach the Supreme Court. Bhubaneswar, June 20 : Odisha Chief Minister Naveen Patnaik Thursday announced assistance of Rs. 5 crore for disaster-hit Uttarakhand, where floods and landslides have washed away thousands of homes and killed over 150 people. The aid would be provided from the Chief Minister's Relief Fund, an official of the Chief Minister's office told IANS. Although local media reports said about 100 people from the state have been stranded in Uttarakhand, officials here are yet to confirm the figure. The Plan size for this year for the state of Odisha is set to rise 24.63 per cent to Rs. 21,500 crore compared to Rs. 17,250 crore recorded in the previous year. Chief Minister Naveen Patnaik and Montek Singh Ahluwalia, deputy chairman of Planning Commission met to discuss the plan size for the state. Ahluwalia said, "The performance is satisfactory and efforts at improving human development indicators are appreciable. Progress has been reached during the 11th Plan in all sectors including agriculture. Focus on human development needs to be continued." New Delhi, April 15 : Odisha Chief Minister Naveen Patnaik Monday said that a Third Front before the 2014 Lok Sabha polls was a very healthy option but it was still "early" to explore the idea. Patnaik, however, ruled out any alliance with his party's former partner, the Bharatiya Janata Party (BJP). "There is no question of any alliance with the BJP," he told reporters on the sideline of a conference here. The Biju Janata Dal (BJD), which has ruled Odisha since 1999, had an alliance with the BJP till 2009. It snapped ties with it just before the 2009 assembly polls. 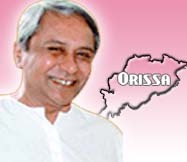 The chief minister of the Indian state of Orissa, Naveen Patnaik has asked the central government for early approval of 45 roads in the Maoist-affected districts in the state to address the issue by development of the region. The CM pointed to the spread of Left- wing extremism in the state and raised the issue during his meeting with Union Minister for Road Transport and Highways Dr CP Joshi in New Delhi. The CM had also informed the union minister of the damage caused by September floods. Jindal Steel and Power Limited (JSPL) announced its ambitious plan of setting up biggest steel plant of world in Orissa. Jindal Steel is all set ready to commission first phase of its 6 mtpa steel project by March, 2012. Company's managing director and Vice-chairman Naveen Jindal had a meeting with Orissa CM Naveen Patnaik. When asked about the progress of the Posco steel plant, Naveen Patnaik, Chief Minister of Orissa, was very confident as he declared that the Prime Minister Manmohan Singh as well as Jairam Ramesh, the Environment Minister have guaranteed to facilitate speedy clearance for the Posco venture worth Rs 54,000 in the state. Orissa Government has taken few steps for AIDS affected persons to improve their standard of living. Naveen Patnaik, Chief Minister of Orissa introduces a new plan for HIV/AIDS affected people; he said that Orissa government is planning to include HIV-AIDS affected persons in the up-coming BPL list. Orissa government had hosted an AIDS campaign Red Ribbon Express (RRE) at Mancheswar Railway station, where Naveen Patnaik said that government is concerned for all the persons affected by AIDS and soon necessary actions will be taken to help the affected people and their family to live normal life. Orissa Chief Minister Naveen Patnaik has announced an innovative plan where he said his administration is eyeing to take in HIV/AIDS affected persons of the State in the forthcoming BPL list. The CM stated that his administration is taking active steps to assist AIDS-affected people as well as their family members to live normal life. He added that this while welcoming the AIDS campaigner Red Ribbon Express (RRE) at Mancheswar Railway station amidst blowing of conch and other musical instruments by cultural troupes. Bhubaneswar, Jan 8 : A day after steel billionaire L. N. Mittal expressed unhappiness over the delay in his Indian projects, Orissa Chief Minister Naveen Patnaik Friday said Mittal's project in the state was very much on track. "Mittal's project is very much on the track. The project will certainly come up in the state. We have not received any negative message from the Mittals," he said. The state government has also clarified that the proposed Mittal project would not be shifting to Karnataka. Bhubaneshwar, Dec 24 : Orissa Chief Minister Naveen Patnaik, unveiled the mascot “Gori”of the 15th National Youth Festival here on Thursday. It is Gori, an albino crocodile, which will welcome the guests of youth festival which will be held from January 08 to 12, 2010. Gori, a 34-year-old rare white crocodile, which was reared and bred in Bhitarkanika Wildlife Sanctuary, was chosen as mascot to promote wildlife conservation. Moved by the outstanding feat of a dance group from Orissa at a competition organized by a TV channel, chief minister Naveen Patnaik announced to set up an institute to sharpen the talent of young performers in the state. It is learnt that the state government would provide four acres of land near Berhampur, and provide a sum of Rs 1 crore for the setting up of the institute. A release from the CMO said that the culture department has been directed to start working on this. In a setback to Orissa government demanding revision of coal royalty, the Center has refused to hike coal royalty at this point of time. However, Orissa Chief Minster, Naveen Patnaik, said that the state would approach the Union Finance Commission about the issue. Clearing the government's stance, Union Minister of state for Coal, Mr. Sriprakash Jaiswal said: "There is no meaning of revision. Whatever coal royalty is being given is more than sufficient. We are worried about how production of coal could go up. We want to double the production. Accordingly, the royalty would also increase (pro rata)." New Delhi, Aug 4 : Orissa Chief Minister Naveen Patnaik met Prime Minister Dr. Manmohan Singh here today and demanded more flood relief funds for his state. Patnaik told, "I met the Prime Minister regarding many important matters for Orissa. First of all, the funds that the Centre owes to us for very serious floods that happened last year in my state. That money is owed to us." Patnaik said that he had also asked for funds for the mid-day meal scheme in his state. Bhubaneshwar, May 21 : Biju Janata Dal (BJD) leader Naveen Patnaik was sworn in as Chief Minister of Orissa on Thursday for the third consecutive term. State Governor M C Bhandare administered the oath of office and secrecy to Patnaik at Raj Bhavan. In the recently held State and Lok Sabha elections, the Naveen Patnaik-led BJD registered a thumping victory. In the State Assembly elections, it won 103 of the 147 seats. Bhubaneshwar, May 20: The Biju Janata Dal leader and Orissa Chief Minister Naveen Patnaik will take the oath of office at 11.30 a. m on Thursday marking his third inning as CM. "I have been invited to form the government by Governor M C Bhandare," Patnaik, who called on the governor at the Raj Bhavan on Wednesday. Patnaik held discussion with the Governor Bhandare for about 25 minutes. Bhubaneswar, Apr 8 : Orissa Chief Minister Naveen Patnaik today ruled out supporting Congress or BJP-led government at the Centre after the general elections. Addressing an election meeting along with NCP chief Sharad Pawar and CPI (M) leader Sitaram Yechury, Patnaik said he was happy with the seat-sharing arrangement reached between the three parties for Lok Sabha polls in Orissa. Gorakhpur, Mar 28 : Bhojpuri actor and the Samajwadi Party (SP) leader from Gorakhpur, Manoj Tiwari, filed his nomination papers for Parliament elections on Saturday. Bollywood actor-turned politician Sanjay Dutt was present on the occasion. Sanjay Dutt is expected to campaign for Tiwari. Bollywood actress Jaya Bachchan, actor-turned politician Jayaparda and SP General Secretary Amar Singh are also expected to participate in the campaign. Bhubaneswar, Mar 11 : The Naveen Patnaik-led Biju Janata Dal Government on Wednesday won the trust vote through a voice-vote in the State Assembly here. The Opposition, however, alleged that the Speaker of the Assembly had behaved unfairly during the motion by not allowing members to speak. A special one-day session of the State Assembly was summoned on Wednesday, where Patnaik required at least 74 votes to prove his majority in the 147-member House.